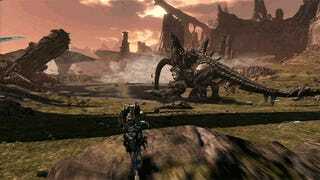 I’ve spent a lot of time in the sprawling open world of Xenoblade Chronicles X, doing quests and just exploring. And given how much time I’ve spent running, that got me to wondering just how large the main continent was. Then I promptly broke it. Thus I decided to quick travel to one side of the map and run to the farthest point (that I could reach anyway). Long story short? It took 31:25. I should mention that what I ran may not be the straightest path (as mountains and cliffs are often in the way), but it is the quickest path I know. And if nothing else, it sure was one heck of a scenic trip. If you want to see a time-lapsed version of the run, check out the video below. And if you have the game and can beat my time, run it yourself and post a video below.